R.B. Crowther Co is a self-performing commercial roofing contractor specializing in the low slope roofing industry. Performing new and replacement roofing projects for Commercial, Industrial, and Institutional Buildings. R.B. 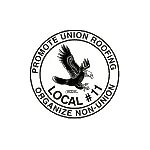 Crowther Co Provides Completely Trained and Skilled Union Tradesman to Perform All Your Roofing Needs.